Using a motion blur technique to accentuate the speed of a vehicle is nothing new. It is however a difficult skill to master. Many variables are involved…how fast the vehicle is moving, how close you are to the vehicle, what lens focal length you choose to capture the subject with are all factors to be considered in order to "freeze" your subject against a blurred background. It involves ‘panning’ the camera along the trajectory of the vehicle. When choosing the appropriate shutter speed for your exposure you have to go slow enough to blur the background and catch the vehicle’s wheels spinning. After a few thousand attempts at this I’ve been able to consistently turn out images like this one. I have used this technique at NHRA national events to capture 300+ MPH top fuel dragsters and Funny Cars. I have used this technique at The Pirelli World Challenge and the IMSA WeatherTech Racing Series at Lime Rock Park in Lakeville, CT to capture some of the most beautiful race cars in the world. 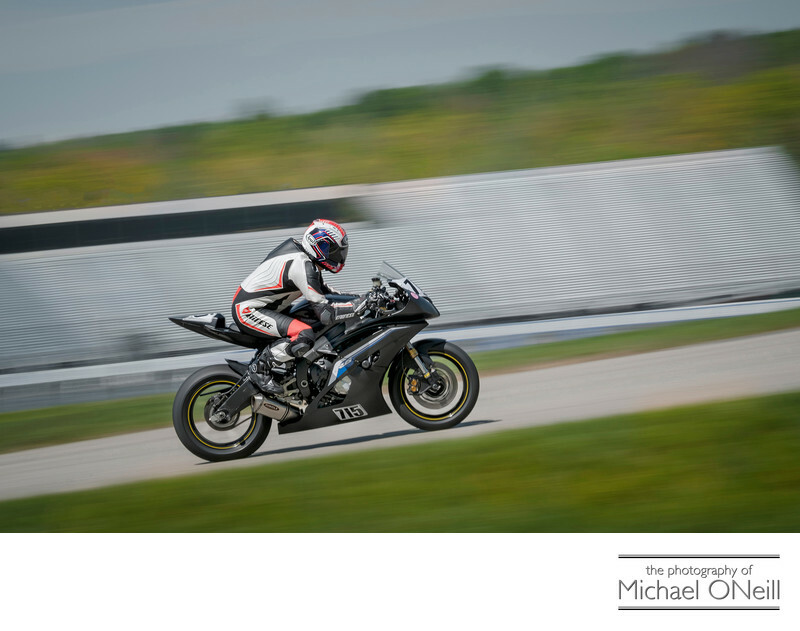 I have used this technique to capture motorcycle road racing for the Championship Cup Series and MotoAmerica at New Jersey Motorsports Park in Millville, NJ. This image of a motorcycle competing in the Loudon Road Race Series was taken on the road course at NHMS (New Hampshire Motor Speedway) in Loudon, NH. This picture was taken as the rider was charging up hill out of turns 6 and 7. The blurred linear background is actually the main grandstand of the track a few hundred yards away. The rider is moving in excess of 150 MPH at this point but the excellent camera technique froze him in place…standing still at 150 MPH!